A new campaign by the U.S. Travel Association aims to promote the benefits of travel to consumers who have been cutting back due to economic concerns. It comes on the heels of new laws, partnerships, packages, and rates designed to make leisure and business travel more accessible and less arduous. Many of the new travel tools are designed to give a bit of control back to people who had come to believe last vestige of fun disappeared from air travel with the arrival of the TSA pat-down. You'll see more agents and airlines offering more customized service and a higher level of social media engagement (for tracking fares and offering feedback), and hotels striving to lure new customers by offering elite-level perks at regular hotel prices. Whether for a weekend jaunt or a trip around the world, here are the trends travelers can expect in 2013. Alaska Airlines' (ALK) reward swap with Emirates is just one of the many new partnerships of 2013. Thanks to a tech upgrade, Vietnam Airlines' staff will be able to recognize and customize a traveler's experience based on their preferences. On the other end of the spectrum, Delta (DAL) recently revamped its rewards program to make it harder to earn elite status, in order to "truly target our best customers." To do that, Delta added a spending threshold that doesn't include taxes in the reward amounts. The airline says the program won't take effect until January 2014, but customers should attempt to redeem or transfer their reward points before the end of this year. Travelers who have grown fed up with U.S.-based airlines will have plenty of new alternatives as many foreign carriers expand their services both within the States and internationally. Air China continues to expand in North America, with nonstop service between Houston and Beijing. Virgin America now flies from Vegas to L.A. Air Canada is adding new flights to Istanbul, Seoul, and Beijing from various U.S. cities. Domestic carriers are also adding routes, and while the competition isn't likely to drive prices down, travelers can expect airlines to compete in less-tangible, flyer-friendly ways. 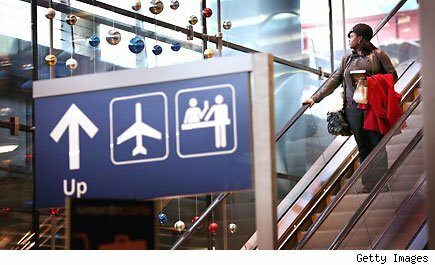 Lines at baggage carousels might get shorter this year, as the "No Hassle Flying Law" goes into effect. The law allows TSA to determine which flights need luggage reinspection upon entry to the U.S. Unless there's a specific threat, international travelers from pre-clearance countries (like Canada, for instance) will be able to skip a second inspection. Although it's still early in 2013, travel reservations are already outpacing those of this time last year, and this trend is set to continue into 2014. This means more crowds, blackout dates, and lines at attractions. Despite the stress of trying to navigate a popular tourist destination when it feels as if the whole world has converged on it for the same week you picked, an increase in the number of travelers is a good thing. While many people consider travel a luxury, millions of us consider it a living. According to the U.S. Travel Association, 14 million American jobs are dependent upon travel-related industries. International and domestic travelers spent $1.8 trillion in the U.S. in 2010, which generated $118 billion in tax revenue at the local, state, and federal levels. There's no standard menu of the amenities travel providers offer, so it's best to ask what you're getting. This is equally true for surprise fees, family accommodations, or rate differences for special-occasion trips like honeymoons or retirement celebrations. It's often the case that front-line staff aren't aware of new programs coming out of the corporate office, and the roll outs of new perks frequently come with some glitches. Surprises at an airport or train station are never fun, especially when coupled with a language or cultural barrier. Travelers would be well-advised to bring along a document containing all their reservation information, including confirmation numbers, amenities and services promised, and the contact information of the travel agent or booking representative. You can follow Motley Fool contributor Molly McCluskey on Twitter @MollyEMcCluskey. She doesn't own shares of any of the companies mentioned.